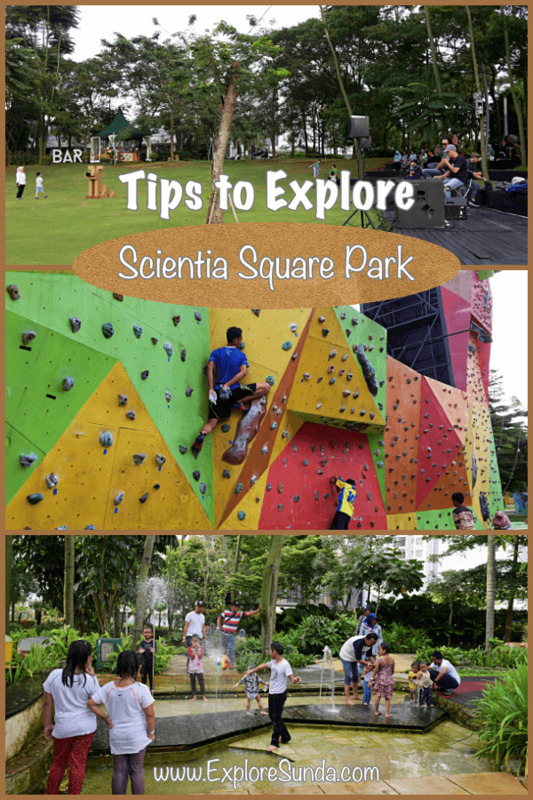 Do you love outdoor activities? 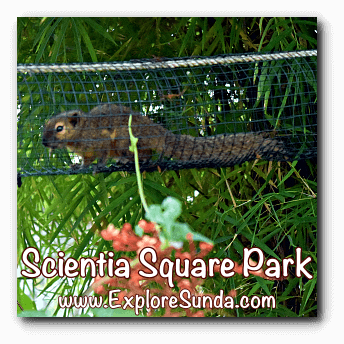 If so, Scientia Square Park is a place to go! 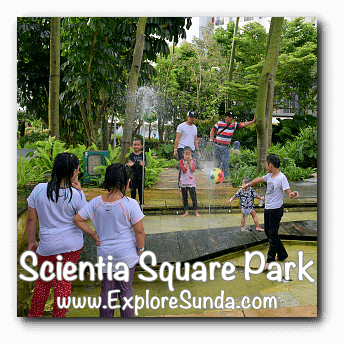 Scientia is a park where we can do many outdoor activities, such as: wall climbing, skate boarding, in-line skating, feeding the rabbit and fish, learning the metamorphosis of butterflies, or just play with water and swing following the gravity. 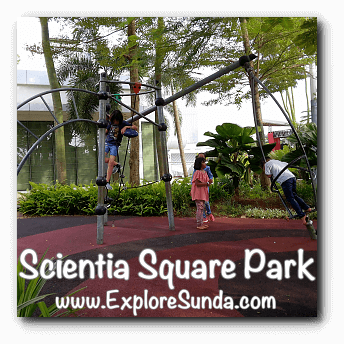 Let's explore Scientia Square Park! 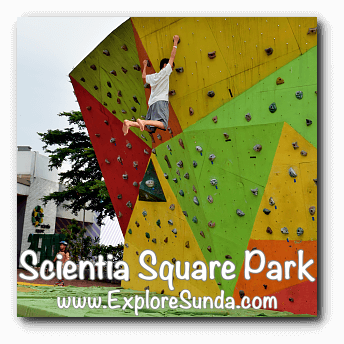 The first thing we will see when we enter the park is the huge and colorful wall for wall climbing. Everyone can try it here without the safety equipment, since most of the walls are not that high and thick layers of foam are laid in front of it to absorb our falls. One staff guards the end of the wall, which is the highest wall. He looks after the safety equipment there. There is a flat and smooth yard right in front of the wall climbing activity. It is used for playing in-line skate. We can bring our own or rent them. We can even take short courses here. Of course, both renting the shoes and the courses require additional tickets. Next, we will find some bars where we can try to excel on a monkey bar and its variations. Be careful though, because there isn't any safety net or padded floor to absorb your falls. 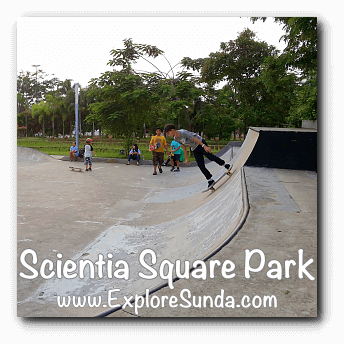 Bring your skateboard to Scientia, you can hone your skill here, since there is a special ground with several slopes especially designed for skateboarding. The park also provides skateboard for rent, of course additional ticket is required. Have you ever played snake and ladder? 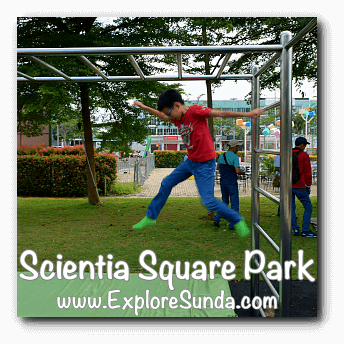 Scientia has the giant version of it called Slides & Ladder, where the players become the counter! There are several giant dices and based on the number we get, we will walk through the path, either flat, hike the ladder or slides :) The ticket is Rp. 30,000 per person. If there isn't enough players, the staffs will accompany you to play. There is a big tent next to the Slides & Ladder. It is for jumping up and down on trampoline. 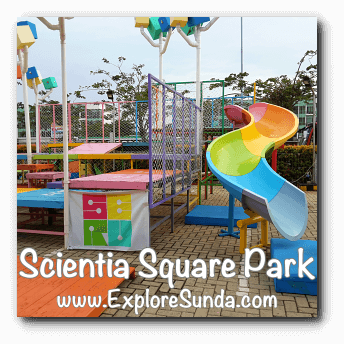 Similar with other activities, there is additional charge to play here. In the center of Scientia Square Park lays a big lawn with raised benches called Universe Amphitheater. On weekends we can enjoy live music. Children can fly kites, play ball or just run around here. 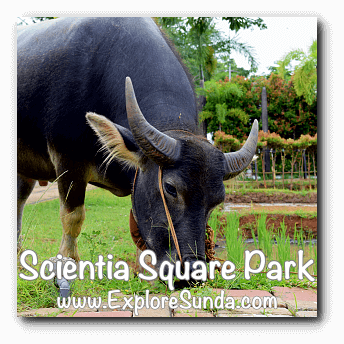 Right in front of the amphitheater is a paddy field, complete with the water buffalo! Then you can hear engine revved in the background. It is the sound of the Radio Control Cars (RC Cars). The tracks are behind the paddy field, they are only separated with shrubs. Being outdoors mean we can feed and touch animals. 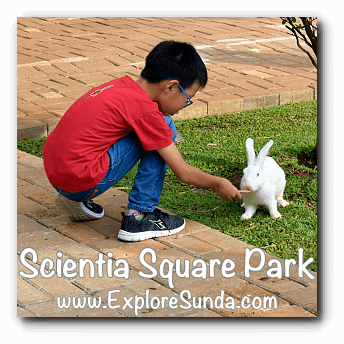 In addition to the water buffalo in the paddy field, Scientia also has a butterfly garden, koi ponds and rabbit house. Usually children are eager to feed the koi fish and rabbits. We only need to buy carrots for feeding the rabbit. The butterfly garden is the green house in front of the rabbit habitat. Supposedly, we can learn the metamorphosis of a caterpillar until it becomes a beautiful butterfly here. Unfortunately, the butterflies are scarce, we can not find any caterpillar, and the cocoons are still far away from hatching. The cutest thing there is the three squirrels. They have nest up above the ground and they can only run inside the tunnels of wires. Since the ticket is a paper bracelet, we can go in and out multiple times during the day as long as we wear it. Why would we do that? We might want to have lunch or dinner in one of the restaurants there or try to cool down inside Summarecon Digital Center, even take a ride of Evolution - Journey of the Earth at the first floor of SDC. 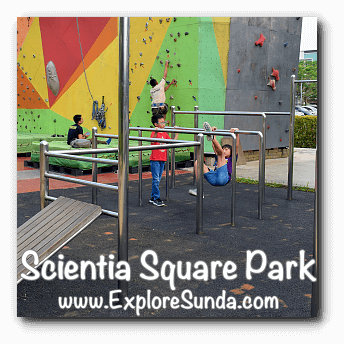 Where is Scientia Square Park? 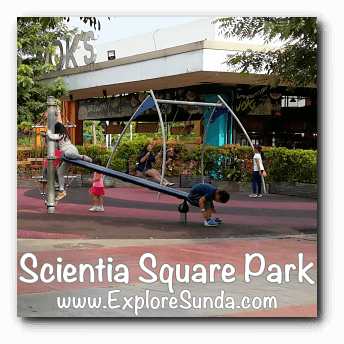 The address is jalan Scientia Boulevard Gading Serpong, adjacent to Summarecon Digital Center. The coordinate is -6.2566667,106.6152725. Scientia opens at 6am everyday. There are several tickets available, as well as memberships. The price of the basic ticket is Rp. 25,000 for weekdays and Rp. 50,000 for weekends. 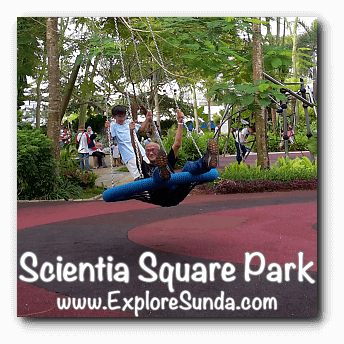 Then there will be additional tickets for some activities and courses inside the park.